We have a new member of the family! The lovely green furry octopus! She also lives at my office. 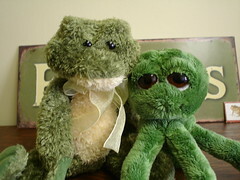 Since the furry frog was a bit lonely on week-ends. Publié par Meb à 8:47 a.m.